1.1. Before making a reservation, you must read, understand and accept Terms and Conditions. If you don’t understand Terms and Conditions, we strongly recommend that you contact our Customer Support Service, available via email address or via telephone numbers indicated in Contact section. This website is translated into several languages. The official version of the website is in English. In case of discrepancy between the original and translated version, English version is to be considered as relevant. 1.2. Reservations are made online using our booking service. 1.3. Journey can be One-way or the Return. 2.1. Private transfer: Private transfers are provided with sedan, minivan, minibus and bus. 2.2. Custom Transfer: For destinations not listed or special vehicle types or multi-stop transfers etc. a customer can order a Custom Transfer. Custom Transfer can be ordered by telephone or email. Custom Transfers can be subject to a different set of Terms and Conditions that will be presented to the customer when all details are known and agreed upon. 3.1. A person who wants to make a reservation must be over 18 and have a valid credit / debit card. 3.2. Reservation is carried out online, by filling all the necessary forms. 3.3. Reservation must be made at least 24 hours before the start of the transfer. As an exception, transfer can be booked within 24 hours, but you have to contact us and get an e-mail approval first. Such transfers will be considered as Custom transfers. Special rules apply to such transfers and customer will receive these rules by email, along with Confirmation and Receipt. 3.4. A person who enters the data is responsible for their validity. The Transfer provider company does not bear any responsibility for wrongly entered or untrue information. 3.5. A person who enters the data for the group accepts the terms in the name of the whole group, and is responsible for the whole group. 3.6. Reservation is completed when credit / debit card Company accepts customer’s credit / debit card, and when a transfer of funds is successfully completed. 3.7. Customer is required to show this Receipt to the driver before boarding a vehicle, along with a valid document that proves customer’s identity (identity card, passport, driving licence). 3.8. It is customer's responsibility to review the Confirmation and immediately report any errors or faults to our Customer Service in written form, preferably by email. 3.9. Each Receipt contains a Unique Reservation Code (URC). URC must be entered in order to check the status of reservation, to change reservation dates or to cancel the reservation, and as a reference for further communication between Transfer provider company and a client. 4.1. Each passenger is permitted to bring the standard suitcase or travel bag, and one piece of hand luggage the same size that is allowed in airline traffic, a total of two pieces of luggage. Luggage must be properly marked with the name and surname of a passenger. 4.2. Transfer provider company is not obligated to transport any luggage that was not declared in a reservation if there is not enough room in the vehicle. 4.3. The Transfer provider company is not responsible for the content of luggage. Neither Transfer provider company nor any of its contracted or sub-contracted drivers will accept responsibility for luggage loss or damage. Clients are responsible for ensuring that their luggage is loaded/unloaded at all times, if accompanying the luggage on the journey. Transfer provider company and/or its contracted or sub-contracted drivers have the right to refuse any client or to make the journey due to the client having excess luggage which would result in the vehicle being unsafe whilst in motion. 5.1. Children under 12 cannot use our service unless they are accompanied by an adult. Children 12 to 18 years have to have a certified written permission of a parent. 5.2. For children up to 5 years in the Private transfer, children’s seat is compulsory. Since the children’s seat takes up one seating place in a vehicle, the child counts as an adult passenger. 5.3. People who have special needs such as disabled people with wheelchairs are obliged to specify that in a reservation form in order to ensure appropriate vehicle. In this case a price may be slightly higher. 6.2. If the price of new transfer is larger than the amount paid, customer will be charged for the difference. If the price of the new transfer is lower than the amount paid, the difference will be returned. 6.4. If the transfer is cancelled within 30 days from the date agreed because of the force majeure (natural disasters, death or serious illness of family members, etc.) Transfer provider Company will return the entire amount paid. Client is obliged to provide valid proof in support of their demands. 7.1. If a customer is arriving by airplane, driver will wait for 60 minutes free of charge. If the flight is delayed, waiting time starts when the airplane lands. After 60 minutes of gratis waiting time, customer may be charged extra. For other pick-up points the maximum free-of-charge waiting time is 10 minutes. After that time expires, customer may be charged extra. 7.2. If the customer can't find the driver, he/she must contact our Customer Support immediately and act upon instructions received. If the customer fails to do so within 60 minutes or 10 minutes (see above) gratis waiting time, the driver is free to leave the pick-up point and the transfer will be considered a "no-show". 7.3. "No-show" is a situation where the customer fails to be at the pick-up point on the pick-up date at the pick-up time. "No-show" transfer is charged with 50% penalty. If the customer provided a faulty pick-up address or no address at all during the online booking process, a "no-show" rule applies. 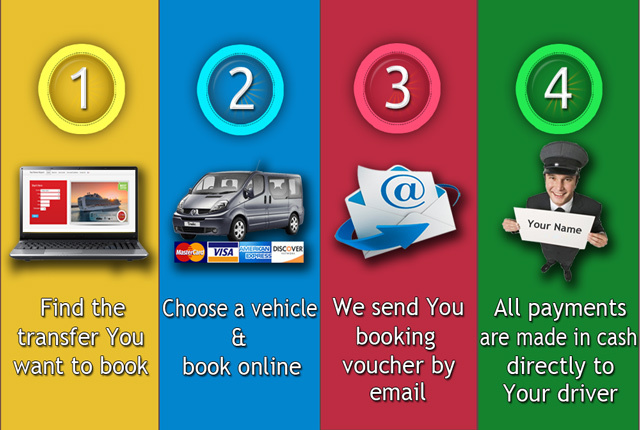 It is customer's responsibility to provide a pick-up address accessible by the vehicle selected. 8.1. All vehicles that are used for transfers are properly inspected and ensured in accordance with the laws of the country where transfer is provided. 8.2. Passengers insurance is included in the price of the transfer. 8.3. A passenger under the influence of alcohol, drugs or other controlled substances won’t be allowed to enter a vehicle and will not be entitled to a refund of the amount paid. 8.4. A passenger whose behavior endangers the safety of driver, other passengers or other participants in traffic will be removed from the vehicle, and reported to local police department. 8.5. Smoking, consuming food and beverages, alcohol or drugs in the vehicle is strictly prohibited. Exceptions to this policy are water and soft drinks in bottles. Everything else has to be approved by the driver or Transfer provider’s representative. 9.1. Transfer provider company is required to perform all the services responsibly and professionally, in accordance with the laws of the country where services are provided. 9.2. Transfer provider company can have their rights and obligations partially or fully transferred to a third person or persons, according to his own choice and without prior notice. 9.3. Verbal agreements between the client and Transfer provider company must subsequently be confirmed in written form (e-mail, fax), otherwise are considered invalid. 9.4. Transfer provider company is not responsible for delays in the arrival or departure caused by unforeseeable circumstances, such as traffic crowds, extremely poor weather conditions, floods, storms, fires and so on (force major), and is not required to indemnify passengers. 9.5. In case that client is not able to find the driver at the agreed place in the agreed time, client is required to contact our Customer Support as soon as possible at +30.6985081517, where he will receive further instructions. Keep a note of our number. 9.6. In case that a client is delayed for any reason, client is required to contact first the Customer Support as soon as possible at +30.6985081517, where he will receive further instructions. Keep a note of our number. 9.7. Transfer provider company cannot guarantee the exact travel time of the transfer. All data regarding travel times are just an estimate. Clients who continue to travel by other means of transport should leave enough time between the end of the transfer and the departure time of another means of transport. 9.8. In case that selected type of vehicle is not available for any reason, Transfer provider company can perform the transfer using another appropriate vehicle. 9.9. Only the Transfer provider company can receive payment for transfers in advance by credit card. No one has the right to charge or try to change the terms of transfer in the name of Transfer provider company, except when it is expressly defined. Only the driver at the starting point can receive cash payment if it is stated on voucher. 9.10. 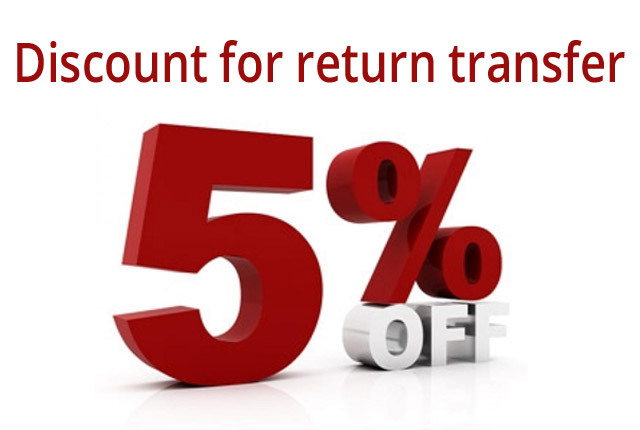 In the event that the transfer has not been made, in whole or in part, Transfer provider company is required to refund the amount paid in full. The client is required to obtain and present evidence in support of their claims. Complaints must be submitted within 48 hours. Complaints without grounds or submitted after 48 hours will be disregarded. 9.11. Transfer provider company is required to consider all complaints and make a decision on them within 28 days. 9.12. If a client is entitled to a refund, Transfer provider company is required to return the amount in question within 28 days. 9.13. All issues will be attempted to resolve by an agreement out of court. 9.14. All the disputes will be presented before a Court in Greece. Your privacy is our priority. We are committed to protecting your personal information at all times, in all situations. Your name and address information is used solely to process bookings unless your prior consent is given. This information will never be sold, given, rented or traded to others for purposes other than order fulfillment. Data is available only to authorized officers of the Transfer provider company. All of our employees and business partners are responsible for respecting the principle of protection of privacy.